The 1989 film Field of Dreams is regularly cited as one of the greatest baseball-themed films of all time. Its popularity transcends an audience of pure baseball fans. The film normally even gets a couple of airings every year on British terrestrial TV (in fact it was shown on ITV4 earlier in the week), making it one of the few baseball-related things that blends into the popular culture of a traditionally baseball-sceptic nation. The iconic phrase ‘if you build it, he will come’ – normally wrongly quoted as ‘if you build it, they will come’ – has been latched on to by many Brits who perhaps don’t know it’s related to Field of Dreams. Even less will know that its true source is a novel, first published in 1982, called Shoeless Joe. I read Shoeless Joe after having watched Field of Dreams on a number of occasions and I suspect most people minded to read W.P. Kinsella’s novel will be in the same position. Everyone will have their own view on film adaptations of novels. As someone who is much more a book person than a film person, I will normally want to interpret the novel in my mind rather than rely on a specific director’s version. One of the joys of reading novels is the way your own imagination plays an active part in the experience and the lack of that involvement – as I watch films, at least – is one of the reasons why that form of entertainment has never really drawn me in. Consequently, I lowered my expectations slightly before reading the novel. Not only was there the obvious obstacle of already knowing the main storyline, but the characters and scenes had already been painted for me. The first mention of the lead character, Ray Kinsella, immediately brought Kevin Costner’s appearance in the film to mind. It’s difficult to say whether that’s an endorsement of Costner’s casting or the fact that his portrayal of the character is familiar and therefore seems ‘right’ in a way that it might not have done had I read the book first. What I can state is that, whatever the reason, it didn’t reduce the enjoyment of reading the book at all. Had I been more ambivalent towards Field of Dreams then my opinion might be different; however, I’m very fond of the movie and the familiarity with the characters as they are portrayed in it, and the main storyline itself, didn’t prove to be a barrier at all. I’m sure part of the reason for this is that Shoeless Joe provided me with exactly what I was hoping for, but was a little cautious of expecting. The novel takes what I enjoyed about Field of Dreams and enriches it. Field of Dreams is a more concentrated version of Shoeless Joe. It simplifies the storyline somewhat, reducing the number of characters and sub-plots involved. 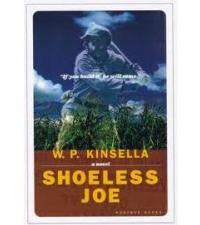 By reading Shoeless Joe, you meet new people and are taken down additional paths. It’s basically the story you know, but with additional elements to it that allow the key themes in the book – following dreams, holding on to memories, reaching out to the past – to be explored further. There is a deeper background story, more detail in the main scenes to lose yourself in and the characters are more richly drawn. In short, if you’ve enjoyed watching Field of Dreams, you will find reading Shoeless Joe just as enjoyable, if not more so. What’s more, I borrowed my copy from the local library, so this may be a rare baseball-related book that you can find relatively easily in the UK. It’s certainly worth hunting down a copy; however easy or difficult that task may be. Have you read “Shoeless Joe”? Feel free to share your thoughts in the comments section below. Can you recommend any other similar books? If so, let us know.